Cross-electrophile coupling is the broadly-defined union of two different electrophiles through transition-metal catalysis under reducing conditions. By avoiding pre-formed carbon nucleophiles, cross-electrophile coupling avoids the challenges of substrate availability and functional group compatibility associated with these organometallic reagents. Substitution of a second electrophile for the organometallic partner in cross-couplings offers the potential to dramatically increase the number and types of molecules that can be easily made because of the large number of commercially available carbon electrophiles (>1 million R-X vs. ~5 thousand R-B(OH)2) and the low cost of all components. We have recently demonstrated reactions that couple organic halides with enones, aryl halides with alkyl halides, acid chlorides and thioesters with alkyl halides, and aryl halides with aryl triflates. Along the way, we have demonstrated their high functional-group compatibility and shed light on certain reactions are cross-selective and others are not. This talk will introduce our current understanding of the origin of selectivity in cross-electrophile coupling reactions and introduce a powerful, new concept for broadening substrate scope: co-catalysis. Daniel graduated from Columbia University in 2000, where he conducted research on helicenes with Thomas Katz. During his PhD work with Jonathan Ellman at the University of California (2000-2005), Daniel worked on improved methods for the synthesis and the use of tert-butanesulfinamide. Following postdoctoral work on Ir-catalyzed allylation chemistry with John Hartwig, Daniel began his independent career at the University of Rochester in 2008. Daniel has been the recipient of an NSF pre-doctoral fellowship, an NIH postdoctoral fellowship, a Green Chemistry award from Pfizer-Groton, a Thieme Journal Award, an Alfred P. Sloan Research Fellowship, a Camille Dreyfus Teacher-Scholar Award, and the Novartis Early Career Award. 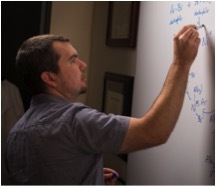 His research program is currently supported by the NIH, Novartis, Boehringer-Ingelheim, and Pfizer.